Unorthodox-Jew A Critical View of Orthodox Judaism: AFTER 60 YEARS OF SEXUALLY ABUSING CHILDREN - HESHY NUSSBAUM PLEADS GUILTY! 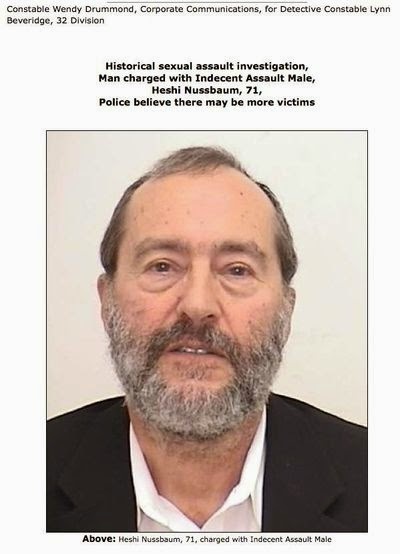 AFTER 60 YEARS OF SEXUALLY ABUSING CHILDREN - HESHY NUSSBAUM PLEADS GUILTY! Feb. 19 2014 - Guilty plea entered on all charges. Sentencing hearing scheduled. March 28 2014 - Sentencing hearing. 3 victims were present. 3 victims read their victim impact statements. Judge couldn't sentence Nussbaum that morning because he needed time to reflect because of the statements. New date scheduled. April 6 2014 - Nussbaum sentenced to 2 years house arrest and 3 years probation following the sentence. I am thankful that unlike US law, the (SOL) in Canada --- these monsters can be charged at anytime, and they can be exposed through legal means without legal repercussions to the victims. A publication ban is in full force with regards to the identities of the victims forever, due to the fact we were minors at the time. What kind of a farce is that to receive no jail time? Is Charles Hynes now a prosecutorial consultant for the Province of Ontario? "Justice" in Canada has always been a joke. It is possible in some circumstances to receive a harsher sentence for illegal salmon fishing than for murder. Illegal fishing gets you a huge fine per fish plus confiscation of your vehicles & equipment. But there have been murderers who got off scott free. There was a melamed in Bobov Toronto who threw a kid out a high window into an asphalt parking lot, almost killing him. Toronto Metro Police just let him escape to NY and made no effort to bring him back. Same thing with Canadian export Ephraim Bryks. Dovid Wax is bringing down with him Mendel Epstein & Gimpel Wolmark - but NOT Belsky. Wax learned in Philly and YTV. He is Belsky's talmid plus there is speculation that Rechnitz may have contributed to Wax's legal defense. Is it any wonder that Belsky is not being named this week? ANY UPDATE ON TORAH TEMIMAH, MARGO, KOLKO????? FOR A WHILE, YOU HAD THEM SCARED! LOOKS LIKE THEY ARE STILL GOING STRONG BOTH IN BROOKLYN AND LAKEWOOD!! THE RESHAIM TRIED TO BRING THEM DOWN....hASHEM SAID OTHERWISE! Bungalow Putz Junior at 1:12 pm says Margo is "still going strong"? Margo has major legal bills from multiple lawsuits and facing huge judgements and insurance problems. Margo's son bailed out of a palace he was constructing in Flatbush and Margo himself has been moving assets around like a scared chicken to hide from judgement day. YTT Brooklyn has been closing classes due to puny enrollments. YTT fell out of favor with Brisk even before UOJ went after them. What kind of "elite" yeshiva has trouble getting their peiros in Brisk? Who ever hears about the Yam haTalmud division of YTT? They thought they were going to play hard to get into but there's kimat no interest anyway. Margo's money launderer Yonason Tendler went bust & took off to Israel. Wolmark did a shidduch a week ago and his new mechutan is a lawyer. Sheesh! A lawyer of all people has no problem mit "a zelcha" bum? How does it usually work with cooperating witnesses? Is DOJ makpid that Wax rat out every single co-conspirator and they will make him regret it if they figure out that he is shielding Belsky? While Belsky did not necessarily participate in every plot with Mendel Epstein, it is believed that the Briskman affair was not the first kidnapping Wax was involved in, so surely he must have crossed paths with Belsky somewhere. What's going on with Nussbaum? Jail?